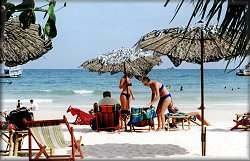 There are many types of tours to take in Pattaya. From nightshows to diving trips. There are lots of activities for all types of travellers. At about 07:30 am we shall come with an air conditioned minibus to pick you up and bring you to Ban Phe. Your English speaking guide accompanies you to the Vongduan Bay of Koh Samet, a national park and also one of asia's most famous places. You will go ashore at the clean beach in front of the MALIBU GARDEN RESORT to have a lunch offering international dishes. After that you will be free to enjoy your paradise island. You will be able to walk around, go for a swim or just relax in a comfortable deckchair. The last boat will leave Koh Samet at 16:00 pm (4:00pm) and the bus will return you to your hotel at around 19:00 PM (7:00 pm). 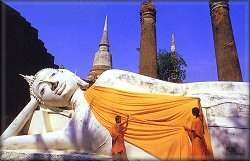 Day 1 Departure from Pattaya at 07:00 am preceding to Wat Pho, the Temple Of The Reclining Buddha. 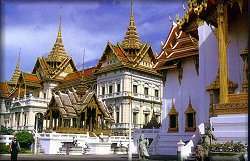 After that we continue to The Royal Place and Wat Pha Kaew, home of the most sacred relic of Thai Buddhism, The Emerald Buddha. Lunch at a restaurant and after we will visit the National Museum before getting a long tail boat along the Chao Phraya River for sightseeing the nature and the everyday life of the Thai people along the river. Then to the hotel and the near by shopping center and the most famous night entertainment area Phatphong street. Note: please dress properly, no sleeveless dress, short pants, T-shirt, sandals or indecent clothing. Pick up time from hotel starts at 04:45 am, leaving Pattaya at 05:00 am. After having breakfast we will go straight to Damnoern Saduak, the famous floating market for a short visit. Having seen the life of people living by the canals we proceed to Royal Thai Handicraft & Factory where skillful craftsmanship of carved teak wood products can be seen. Board our bus again and on to Kanchanaburi to visit the Jeath Museum and then to The War Cemetery where the deceased prisoners of war were placed in burial at the former site of the prisoner camp. 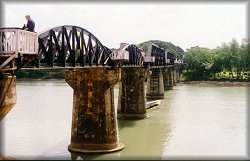 In the afternoon we will take a train ride passing the well known part of the Death Railway. We will have a view of one of the water falls in Kanchanaburi. Then on to our accommodations and dinner will be served at 19:00 pm. Breakfast at 08"00 am and on to explore some caves and then take a long tail boat ride to the famous Bridge Over The River Kwae. Lunch in one of the restaurants in the town. After lunch we are ready to go back to Pattaya. Arriving approximately 19:00 pm. 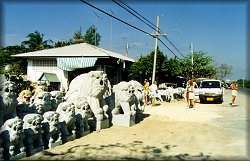 Pick up from hotel at 07:30 am, depart from Pattaya at 08:00 am. 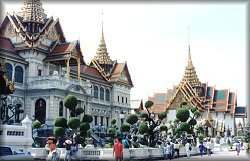 Our tour will start in Wat Kao Sukhim and it's collection of art and craftsmanship. Then proceed to a small street where the occupation of the residents are cutting gemstones. Rubies & green, blue and white sapphires are being cut and polished. Before lunch we will visit the first and oldest church in Chantaburi, The Immaculate Conception. 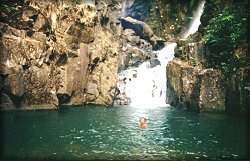 After lunch we will continue our trip to the Pliew water falls where you can swim, feed the fish or walk around and feel the friendly atmosphere away from the bustling city and only the sound of the water fall and crickets will be your sound of music. On the way back to Pattaya we might stop in the fruit market where fruits in season are being sold. Arriving in Pattaya at 18:00 pm and to your hotel. Pick up time from hotel starts at 04:45 am, leaving Pattaya at 05:00 am. After having breakfast we will go straight to Damnoern Saduak, the famous floating market for a short visit. Having seen the life of people living by the canals we proceed to Royal Thai Handicraft & Factory where skillful craftsmanship of carved teak wood products can be seen. Board our bus again and on to Kanchanaburi to visit the Jeath Museum and then to The War Cemetery where the deceased prisoners of war were placed in burial at the former site of the prisoner camp. In the afternoon we will take a train ride passing the well known part of the Death Railway. We will have a view of one of the water falls in Kanchanaburi. Then on to explore some caves and then take a long tail boat ride to the famous Bridge Over The River Kwae. After that we are ready to go back to Pattaya. Arriving approximately 19:30 to 20:00pm. Departure time from Pattaya at 07:00 am. First visit will be at Bang Pa In, the former summer place of KIng Rama 5 who was leading the country at it's most prosperous time. Proceeding to Wat Pha Nan Choern by boat and then to Wai Yai Chaimongkol, a temple of great victory which was built by King Naresuan to commemorate his victory over Prince of Burma n 1592 AD. 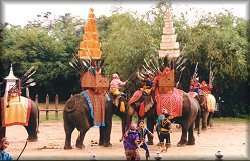 The next temples that we will visit is Wat Mahathat and Wat Rachaburana which is the cremation site of two Princes who were both killed on elephant back duel fighting each other for the throne. Afterwards we will proceed to Wat Sisanpet the formor temple and palace burnt in 1767 AD. The last temple that we will visit is Wat Napramain the only temple that was not destroyed by the Burmese War. Lunch will be served in a restaurant nearby. You will be picked up from your hotel at 07:00 am. 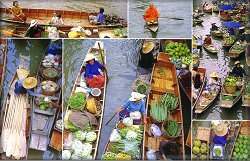 We shall then go directly travel to The Floating Market in Damnem Saduak Village. We will take a long tail boat to pass the canals to reach The Floating Market and the floating trade center. Around this area you will really admire the colorful world market and the simple style of the villagers with their orchards and houses along both sides on the canals. One more interesting place for our tourist group to see is the Teakwood Handicraft Center where there are many skillful craftsmen from northwest Thailand. Our lunch will be at Samphran Crocodile Farm and Zoo. We will watch the magic show including elephants and crocodiles, the wrestling show and an Orchid farm before returning to Pattaya.